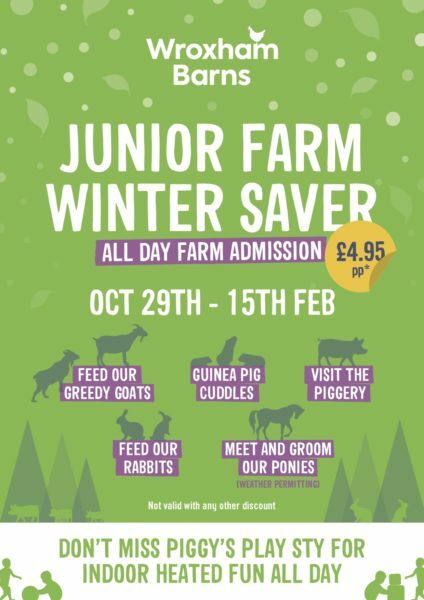 Take advantage of our Junior Farm Winter Saver deal and you could save more almost a third off our regular admission price from 29th October 2018 to 15th February 2019. Come and join us for a warm welcome this winter and pay just £4.95 for all day farm admission (of course Under 2’s and Season Ticket Holders still go free). We’re running our winter programme of farm activity, including twice-daily cuddle time with the animals, pony grooming and learn all about our pigs during the daily piggery feed. Don’t miss Piggy’s Play Sty for heated indoor soft play which is open until 3.30pm every day and all included in your farm admission. In the newly lined and carpeted Big Barn you will discover our new ride-on tractors and there’s indoor playtime in Bella’s Barn too*. 11.00 Feed the greedy Pygmy Goats … they eat lots! *Please note that the Big Barn and Bella’s Barn will not be available 1st-24th December as Santa will be visiting us. Find out more about The Santa Experience on Junior Farm – special event – admission charged and advance bookings only.